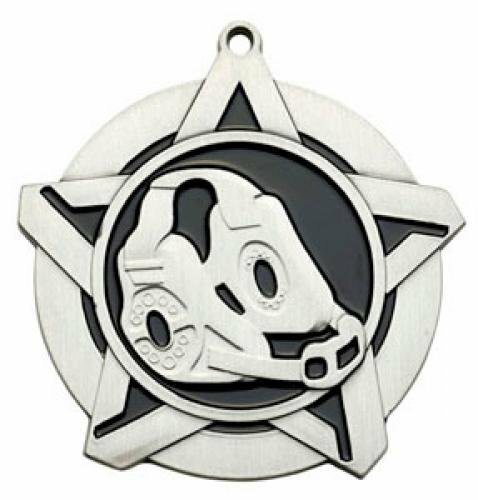 The Super Star Wrestling Medal has a star with a black background and Wrestling design. 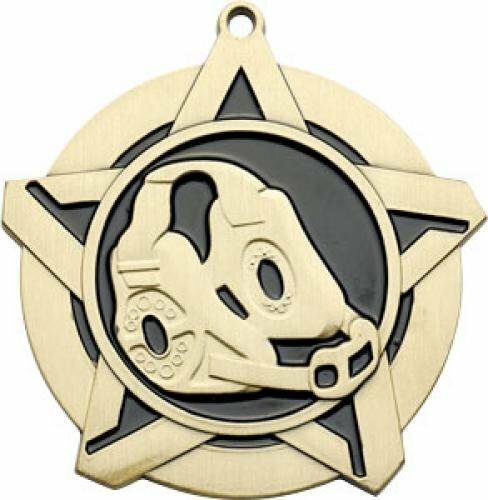 The Wrestling medallion is available in bright gold, silver and bronze. These Wrestling medals look great with your choice of a either a 7/8 inch or 1.5 inch wide neck ribbon. 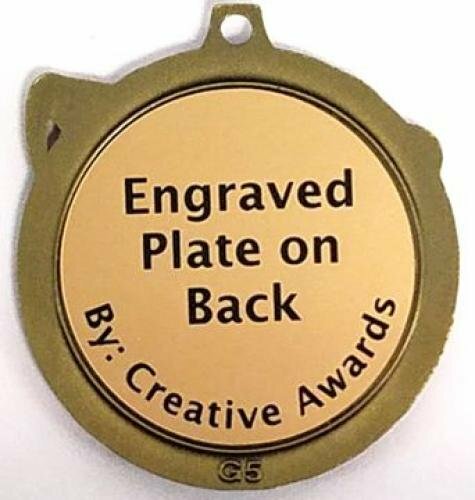 The back of these Wrestling medallions have a round laser engraved plate that can hold up to 5 lines of engraving with 8 to 12 characters per line. 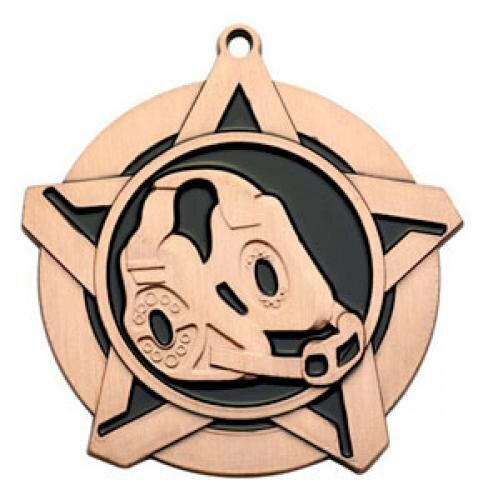 The Ten Star Wrestling Medal has a fun design with 10 cut out stars around the edge and Wrestling icons in the center. 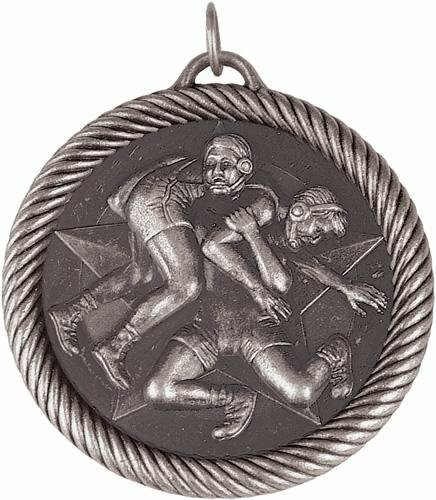 This Wrestling Medallion is available in antique gold, silver and bronze. These Wrestling medals look great with your choice of a either a 7/8 inch or 1.5 inch wide neck ribbon. 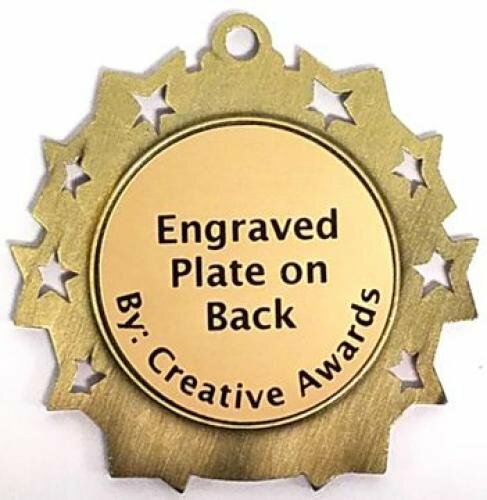 The back of these Wrestling medallions have a 1.5 inch diameter space for an engraved plate that can hold up to 5 lines of engraving with 10 to 15 characters per line. 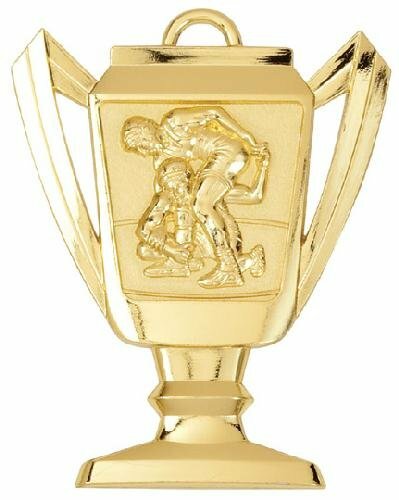 The Trophy Cup Wrestling Medal has a Wrestling design and is available in a bright gold, silver and bronze finish. These Wrestling medals look great with your choice of a either a 7/8 inch or 1.5 inch wide neck ribbon. 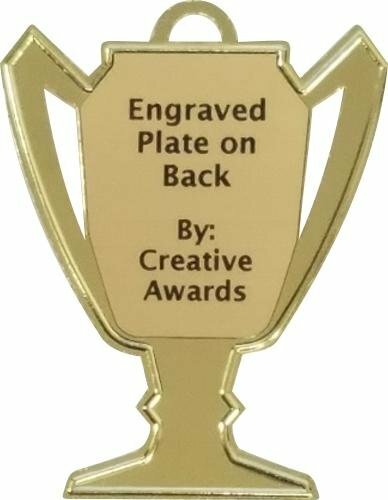 The back of these Wrestling medallions have a 1 inch wide by 1.5 inch tall laser engraved plate that can hold up to 6 lines of engraving with 10 characters per line. The Value Wrestling Medal is economically priced and perfect for a limited budget. 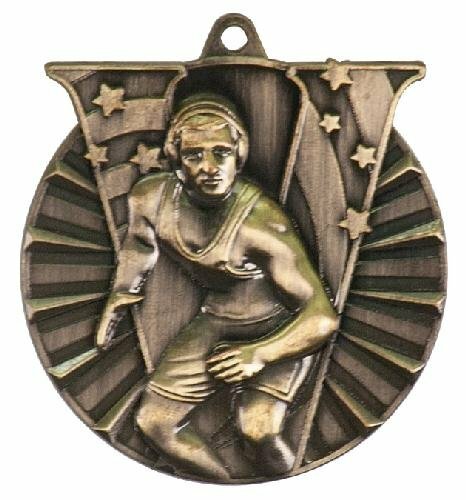 These Wrestling medals look great with your choice of a either a 7/8 inch or 1.5 inch wide neck ribbon and are available in antique gold, silver and bronze. 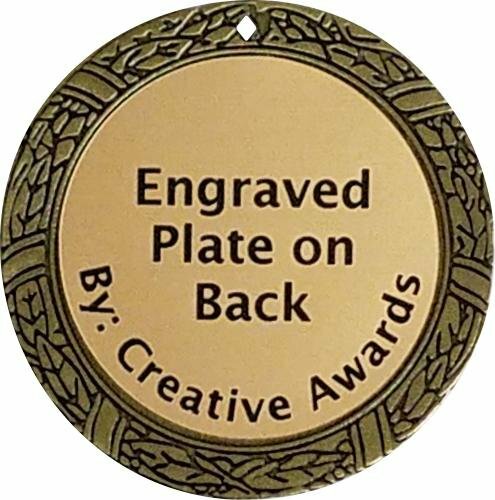 The back of these Wrestling medallions have a 1.75 inch diameter space for an engraved plate that can hold up to 6 lines of engraving with 12 to 20 characters per line. The Victor Wrestling Medal has a swooshed V behind the Wrestling icons. 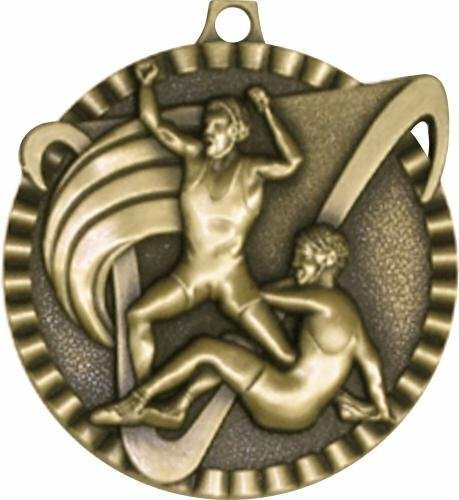 This Wrestling Medallion is available in antique gold, silver and bronze. These Wrestling medals look great with your choice of a either a 7/8 inch or 1.5 inch wide neck ribbon. 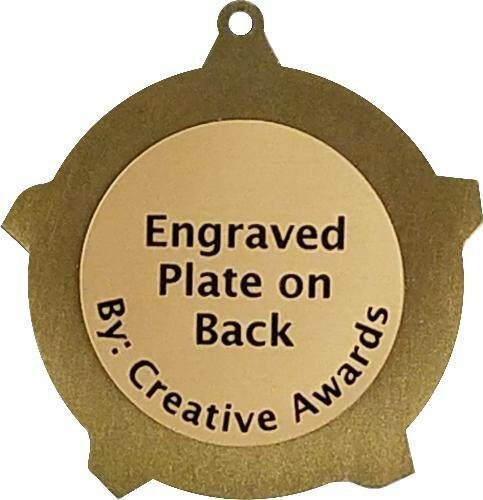 The back of these Wrestling medallions have a 1.5 inch diameter space for an engraved plate that can hold up to 5 lines of engraving with 10 to 15 characters per line. The Victory Wrestling Medal has a large V with rays of sunlight in the background and a Wrestling design in the center. 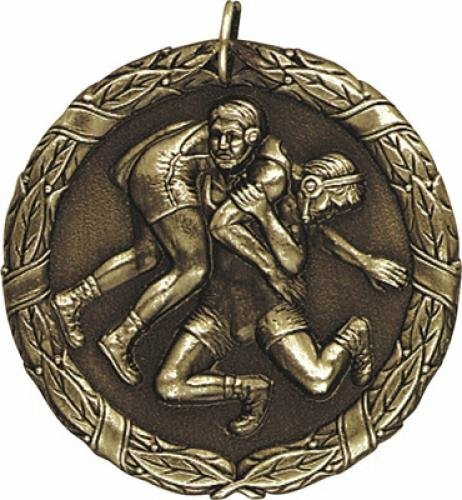 This Wrestling Medallion is available in antique gold, silver and bronze. 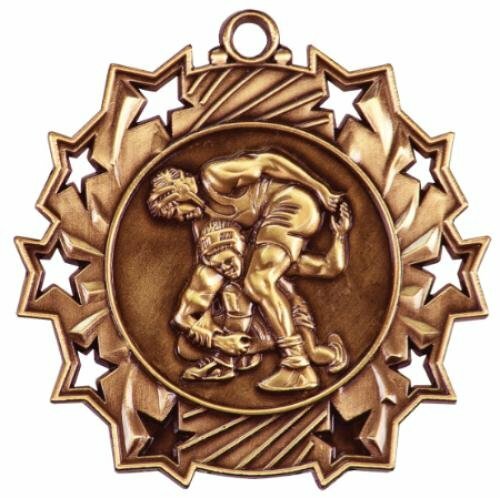 These Wrestling medals look great with your choice of a either a 7/8 inch or 1.5 inch wide neck ribbon. 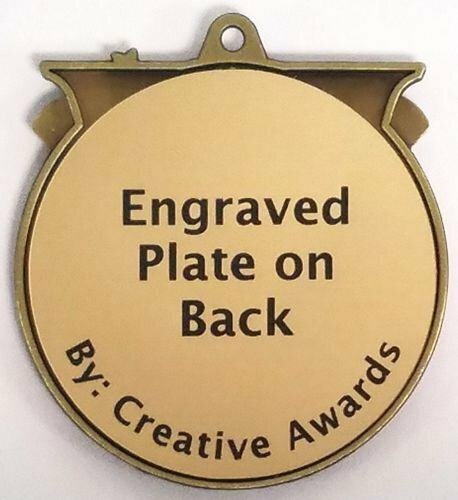 The back of these Wrestling medallions have a 1.875 inch diameter space for an engraved plate that can hold up to 6 lines of engraving with 10 to 16 characters per line. The Wreath Wrestling Medal has a beautifully detailed wreath edge with Wrestling icons nestled inside. 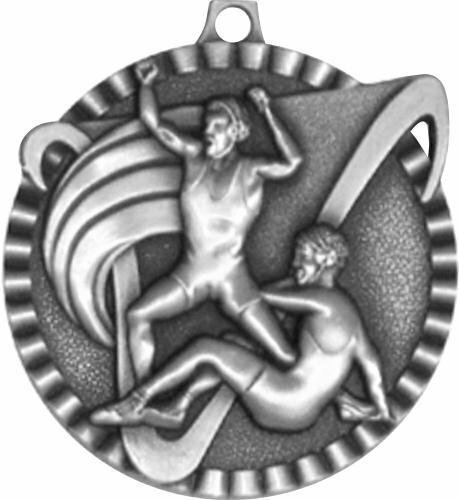 This Wrestling Medallion is available in antique gold, silver and bronze. These Wrestling medals look great with your choice of a either a 7/8 inch or 1.5 inch wide neck ribbon. 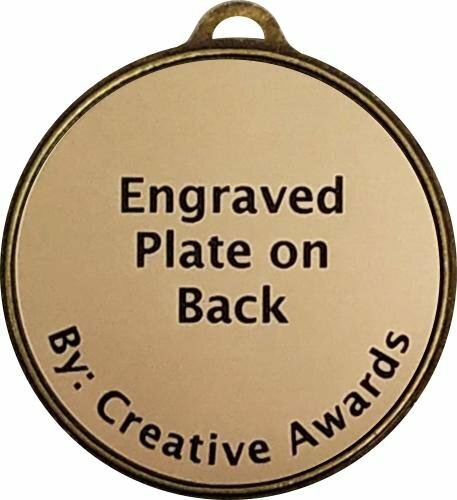 The back of these Wrestling medallions have a 1.5 inch diameter space for an engraved plate that can hold up to 5 lines of engraving with 10 to 15 characters per line.